ZAPORIZHZHYA, Ukraine -- Nine Ukrainian nationalists charged in the decapitation of a monument to Soviet dictator Josef Stalin in the southeastern city of Zaporizhzhya last year have received suspended sentences, RFE/RL's Ukrainian Service reports. 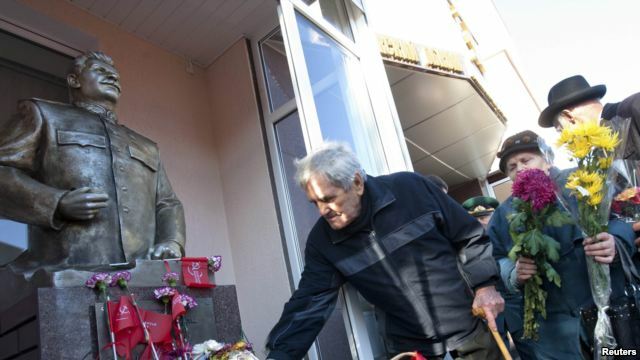 Old Communists leave flowers near the statue of Soviet dictator Josef Stalin in the town of Zaporizhzhya that was "beheaded" in 2011. The activists, who were members of the right-wing nationalist organization Tryzub (Trident), were arrested in January and went on trial in March. Their lawyer, Volodymyr Prudovskyy, told RFE/RL on December 12 that the group's leader, Roman Khmara, and two of his associates were each given a suspended sentence of three years in jail. The other members of the group received suspended sentences of two to three years in jail with probation periods of at least one year. The activists were also ordered to pay some 100,000 hryvnyas ($12,300) to repair the headless Stalin monument. Prudovskyy said the court did not take into account the fact that erecting the monument was itself against the law. "The monument's unveiling was equal to the rejection of the [massive famine in Ukraine known as] Holodomor [and believed to have been organized by Soviet leaders in the 1930s]," he said. "But the court did not take that into account and declined to give any judicial assessment of the fact." Prudovskyy said his clients went through illegal physical and psychological pressure during the investigation into the incident and some of their valuables have not yet been returned to them by police. He added that Communists in Zaporizhzhya unveiled a Stalin monument in May 2010 and Tryzub activists protested, calling Stalin "the executioner of the Ukrainian people and an international terrorist."